Don't let this dry wasteland fool you! We saw javelinas, coyotes, and roadrunners! This dessert was overgrazed by settlers and has earned it's nickname, El Despobado! This was not on our bucket list of places to see in Big Bend National Park but we were on our way to Boquillas Canyon and the sign for Dugout Wells showed a picnic table and it was lunchtime. What a great surprise! We sat in the shade of a blooming tree with such a sweet smell and listed to the birds and bees. The shirt interpretive walk through the desert was surprisingly enjoyable and easy. Just be sure to wear a wide brimmed hat. 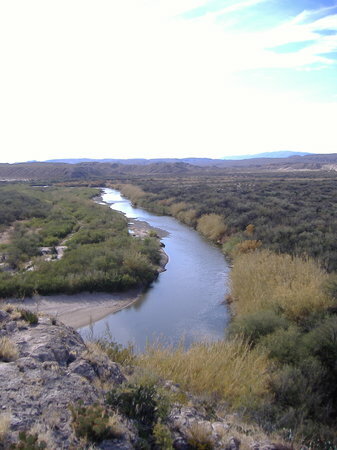 The Chihuahuan Desert is a huge part of Big Bend National Park. 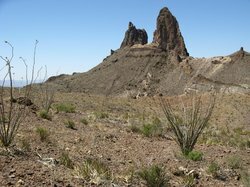 And while Big Bend may not have the green grass and trees of some parks, it has a beauty all its own in the various types of cacti, animals and rocks of the Chihuahuan Desert. It's hot there. Don't be caught without plenty of water. While we are "greenery" type people, we did enjoy seeing the vastness of this desert. It just goes on for miles and miles. You can study the different cacti. We managed to see a rattlesnake, many tarantulas and a road runner too. It is really hot here so make sure that you have plenty of water with you. 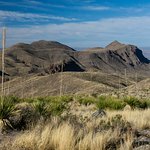 The Chihuahuan Desert, one of the four main deserts of the American Southwest, makes up much of Big Bend National Park and, along with the Chisos Mountains and Rio Grande, is one of the three highlights of the park. 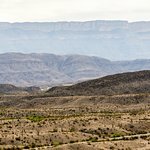 Besides what one sees of Chihuahuan Desert within the park, one will experience even more of it on the long drive to this wonderfully remote National Park which limits the number of visitors; at no time did we experience anything resembling a crowd. 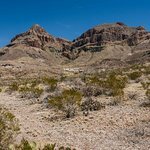 A good introduction to this desert’s plants and their uses in helping one to survive the harsh environment is the very short Panther Path adjacent to Panther Junction Visitor Center. 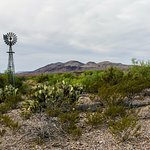 A better introduction to the desert is the longer but still easy 0.5 mile (0.8k) roundtrip Chihuahuan Desert Nature Trail located at Dugout Wells, 6 miles (9.7k) east of Panther Junction, which also offers a shady picnic area in the oasis created by the spring and the still working windmill. 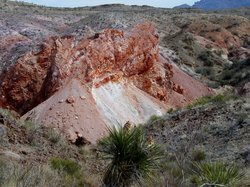 Two other shorter desert hikes that we liked very much included the 0.5 mile (0.8k) loop trail at the Sam Nail Ranch and the 1 mile (1.6k) round trip Lower Burro Mesa Pour-off Trail, both located along the Ross Maxwell Scenic Drive. 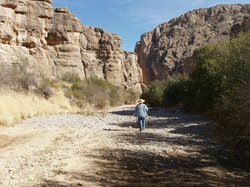 Numerous other desert trails of various degrees of difficulty exist but keep in mind that it is best to plan hikes for the morning as the temperatures rise quickly in the desert. During our spring visit, the mornings started off about 40F (6C) at sunrise and were over 90F (32C) by noon. We find deserts intriguing as what appears to be relatively barren at first, is full of fascinating life upon closer inspection. 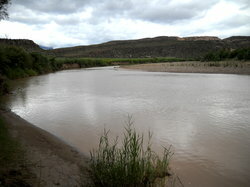 Big Bend is an excellent place to experience the Chihuahuan Desert; the other three of the four major deserts of the Southwest and the National Park that we would recommend to experience them are as follows; Saguaro to see the Sonoran Desert, Great Basin to see it namesake desert, and Death Valley and Joshua Tree to experience the Mohave Desert. Not much to see really but just knowing your driving through one of the biggest dessert in the "World" is crazy! It's a long "hot" drive through the the dessert to get to the Big Bend park. Very scenic. However as your reached higher elevations things cooled down. 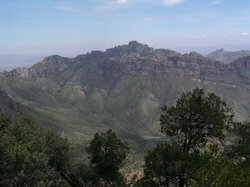 Up to 5,000 ft high in places. Much cooler. It's a must see destination. The 100 degree weather was still there waiting for your return. Enjoy!